The Internet brought the big competitors to those out of the way places. He was now commoditized. In the group, he wasn’t the only one. Nearly everyone in the room was facing more competition now than ever before. Competition from entirely new players (often bringing apples to oranges comparisons, that put you at a disadvantage). Serious downward pressure on fees. In most professional service businesses, you don’t have 80% margins to begin with, so the squeeze can be significant and painful. The only real way to escape is to elevate yourself and get above the fray. You’ve got to become THE authority that your market turns to. There are “tools of the trade” for creating authority positioning, that you’ll want to build into your marketing and your business. You’ve got to start somewhere and in our work with businesses that are going from “unknown” to authority, the very first and most important tool is the decision to create your authority position. Authority is claimed, not bestowed. So claim it. Certainly, you need to have the requisite expertise to back it up, but in my experience, most business owners have knowledge and expertise in spades. They just don’t leverage it in a systematic way to create the authority that will attract better clients and bigger fees. Every professional I’ve ever met had very clear and specific ideas about how his or her profession should be practiced. It’s your “this is how we do it here” opinion. Stop keeping it a secret. Share it with your prospects, clients, and partners. There’s a reason you do it the way you do it…because in your mind it’s the optimal way to deliver your service. Why on Earth would you keep that a secret? I won’t lie to you, it takes confidence to step out and claim your authority, publicly. The good news…confidence is a developed capability. It’s easy to grow your confidence daily with a few simple practices. Dan Sullivan of Strategic Coach says “He who names the game, wins the game.” When you begin to name the things you do for clients you begin to create a new, authoritative, and valuable way to describe the value you deliver. For our clients, each of these names encapsulates a proprietary process and our worldview in that area of our practice. When your prospects start using your language to describe what they want to accomplish, you know you’ve established authority in the market. Let me ask you a question: Do you consider yourself a natural salesperson? Are you more comfortable with the delivery of your expertise, than the selling of it? Most of the successful people we work with would answer “yes” to both questions. The problem is that most of the advice you’ll find on sales improvement requires you to use scripts and techniques that rely on superior sales skills. That’s a recipe for failure. If you’re not comfortable, you won’t use them. Pre-sales education: Before you’re in a selling situation with a prospect, they’re educated on the problem they face, the consequences of the problem, and on the possible solutions. A Conversion Window: Getting prospects to move is always hard. The last thing you want to be is the “just checking in guy.” (I hate those calls and you hate making them.) Your Conversion Window gives prospects a compelling reason to take the next step now, without you having to pressure, cajole, or wrestle them to the ground. Your Disqualification Filter: Sales is primarily a disqualification process. You’re really searching for the very best, most ideal, perfect-fit clients. If you build a real system (based on authority) to attract great clients, you’ll have an abundance of opportunity. So, set up a filter—an application, fee for initial meeting, limited availability (there are a dozen ways to do this, get one)—to put a small speed bump right before your sales meeting. Great prospects will gladly go over it, and you’ll have the experience of only talking to excited, motivate soon-to-be clients. This is a powerful and under-used authority-building strategy. And, the most iconic story of a delivery system used to create authority position in the market is all about BEER! Specifically, the Schlitz Beer marketing created by Claude Hopkins in the early 1900s. 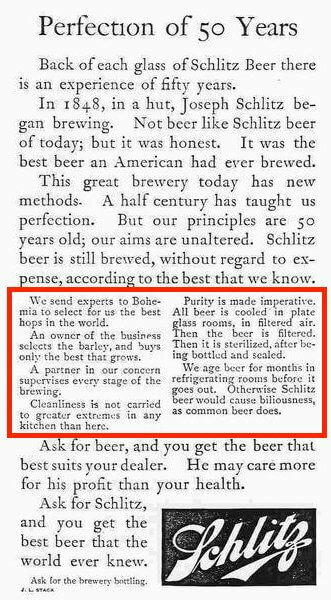 Schlitz was struggling as the #8 brewer in the country. Every beer at the time was marketed as “pure,” which meant simply saying your beer was pure didn’t have any impact on sales (note: this reality exists in most industries…everybody says the same thing…it still doesn’t work). In comes Hopkins, hired to create a new ad campaign for the beer. He asks for a tour of the brewery and immediately sees the solution. Make the process of purification visible to the market. Sure, it’s the same process used in every other brewery, but if you’re the only one telling the story, you own it. Instead of simply saying Schlitz was the purest beer, he demonstrated why it was the purest by showing the process. Schlitz went from #8 in market share to #1. Reveal your process. We give attention to the people who show up in our lives consistently and frequently. Attention is the first and necessary ingredient of authority. Show up and be valuable at least monthly (ideally more often). If you can meet with a prospect anytime the prospect wants the meeting, you’re not an authority. You’re desperate for business. Control your availability through the calendar. Not only will you be more productive, you’ll have a less chaotic schedule, and you’ll create both the perception and the reality that your time is valuable. The calendar gives you the ability to subtly apply scarcity and urgency in a very real and believable way. I see this with business owners that aren’t crystal clear on their priorities…they can get easily swayed into commitments that destroy their authority positioning. Conversely, because they don’t have clear priorities (one of which being “build authority”), the actions needed to achieve the positioning you want never get done. I know these seem really obvious, but it trips up enough people that it’s worth making it conscious. And your market will see you as a peer with the people you associate with. Associate with other well-regarded authorities in your market. Not only will it elevate your positioning, it will expand your thinking and give you opportunities to interact with smart people, doing big things. On the other hand, if you’re always “business visible” with small-time players you’ll be put in that category. Maybe that’s a sad statement on human nature, but it’s also true. Work with human nature, not against it. Be intentional. You’ve now got the 10 tools of authority, but to bring it into reality, you must be intentional about the process. Want to organize your thinking and your action? Attend our next free training session on developing your authority position.